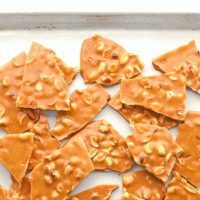 This buttery Peanut Brittle Recipe will become a yearly holiday favorite, plus it’s the perfect treat to package up and share as an edible gift. Growing up the appearance of rum balls, toasted pecans and peanut brittle meant it was Christmastime. Each year they were a constant on the buffet of goodies. Other treats would come and go, but that trio was a given. I remember watching and smelling the rum balls and roasted pecans being made, but somehow the peanut brittle seemed to magically appear. Now that I am older and can make it myself, I imagine my grandmother probably made it after we went to bed to avoid distractions or any mishaps from little ones tugging on her apron. Although it is quick to make it requires constant attention and is a very hot endeavor. It’s not a recipe I would call kid-friendly, except the end part—the crushing of the brittle. That part is totally kid-friendly! 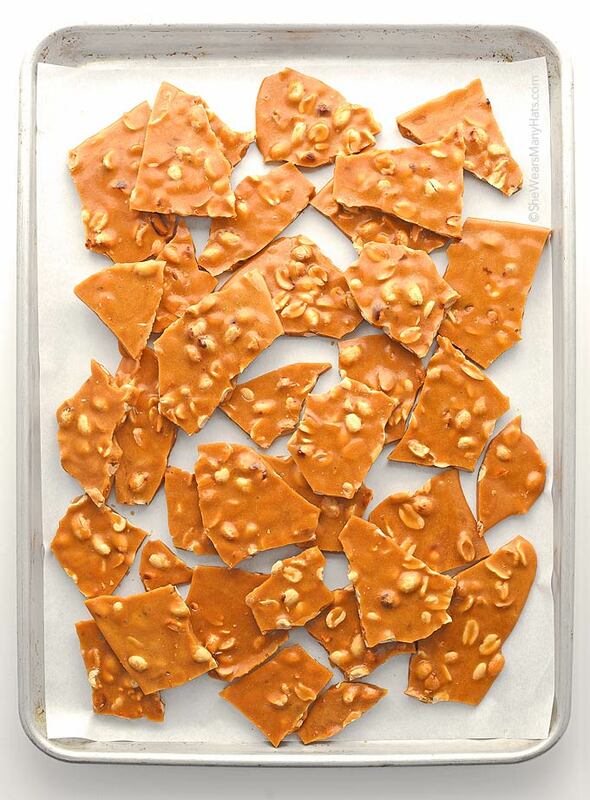 Peanut Brittle is not only a buttery and crunchy addition to any holiday occasion, it is the perfect treat for sharing as an edible gift. It packages well and will last for up to two weeks when stored tightly covered. 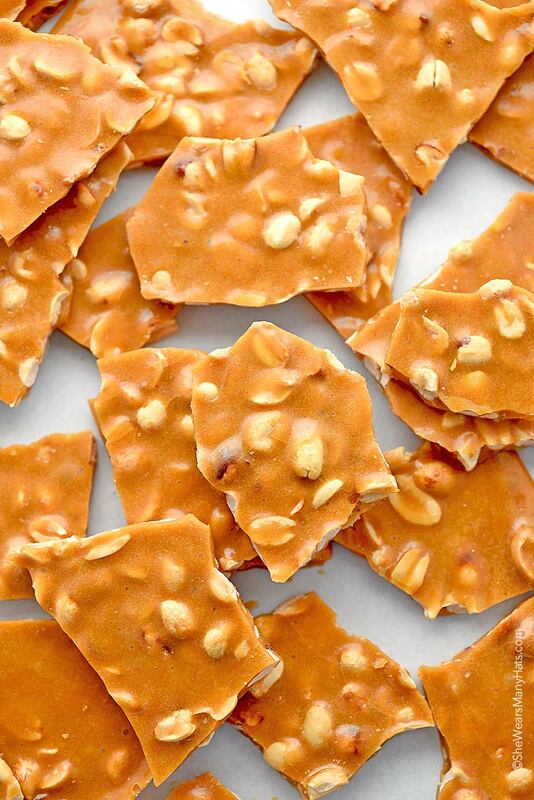 So whether you’re needing to ship a treat across the country or just walk it next-door to your neighbor, Peanut Brittle won’t disappoint. Have all ingredients measured out and ready to go before beginning to cook the brittle. Once temperatures reach 280-degrees F, things progress pretty fast. This is a very hot process. Be careful when adding in salt and vanilla and then again with the baking soda as the mixture will bubble and foam up, releasing lots of steam. This buttery nutty treat makes a perfect edible gift for the holidays. Line 1 (18x13-inch) baking sheet with baking parchment paper (NOT wax paper), silicone baking liner, or butter well. Set aside. In a medium heavy saucepan combine sugar, corn syrup and water. Bring to a boil over medium-high heat, stirring occasionally, until sugar is dissolved. Insert candy thermometer, being careful not to let it touch the bottom of the pan. Add butter; continue cooking, stirring occasionally. When candy thermometer reaches 280-degrees F, stir in salt, vanilla extract and peanuts; continue cooking, stirring constantly. Be careful as the additions will cause mixture to bubble up. When candy thermometer reaches 300-degrees F, remove pan from heat and stir in baking soda. Be careful as baking soda will cause mixture to foam up. Quickly and carefully pour mixture onto prepared baking sheet. Using a rubber spatula, quickly spread brittle evenly across baking sheet. Allow to cool. Once brittle has completely cooled, break into pieces, and store in air-tight containers for up to 2 weeks. Have all ingredients measured out and ready to go before beginning to cook the brittle. Once temperatures reach 280-degrees F, things progress pretty fast. This is a very hot process. Be careful when adding in salt and vanilla, and then again with the baking soda as the mixture will bubble and foam up, releasing lots of steam. Originally published December 8, 2014. I could literally eat that entire tray, looks perfect! This looks perfect! I love peanut brittle with all my heart. This looks so festive and delicious! That is very sad. 😉 Are there ways around the humidity issue? Any adjustments? This is why I need a candy thermometer, like now!!! this peanut brittle looks great!!! how fast does it cool? could you omit the peanuts and add chocolate on top? thanks! It cools pretty quick. And yes, you could omit the nuts and once the toffee has set, pour melted chocolate over the top. It would be like almond roca without the almonds. 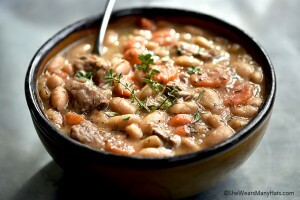 I use this same recipe except add raw peanut without shells and cook untilyou can smell them roasting. Peanut brittle also equals Christmas time to me! I just purchased a candy thermometer. I love peanut brittle. Perfect. 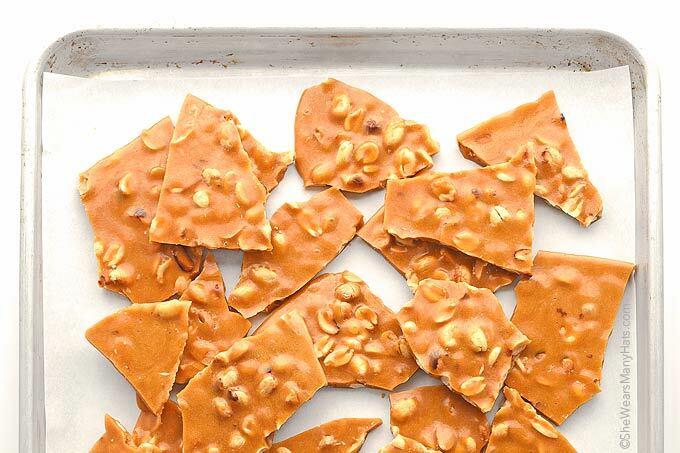 Never made peanut brittle ever. I was worried it wouldn’t turn out great. I followed the easy directions & the brittle came out perfect. 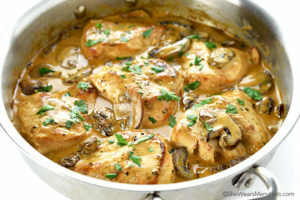 Thank you for sharing your recipe with me. My family loves it & I was tempted to eat the whole pan lol. Definitely going to make more brittle later. I’m so happy to hear that, Lorraine! And yes, it is very tempting. My granny taught me to make it as recipe above except after it foams up it’s poured out onto a buttered enamel topped table and the edges pulled super thin as it cools and pieces cracked off and cooled on wire rack. Fingers buttered too. Careful. It’s hot.